Amanda's Quick Bite for Healthy Living: Easter Fun! Ava was excited to see the duck on the top of the box. She was shaking with excitement when she saw her presents. Easter weekend was so fun! 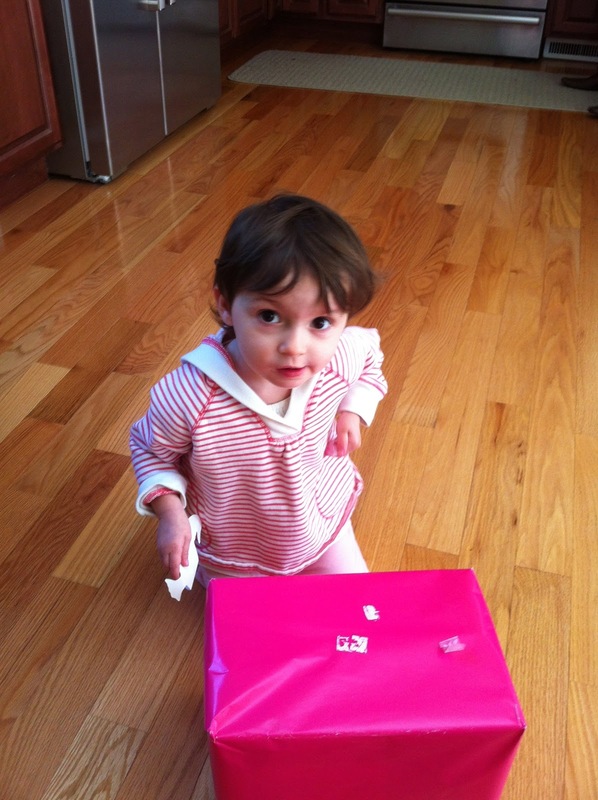 On Friday afternoon, Ava got a package from my mom with Easter goodies. She was so excited when she saw her hot pink box in the kitchen when we got home from daycare that afternoon! Grandma Anna sent her a bunny and an adorable bunny themed plate and cup. She immediately put the plate and cup on the table and said "comin" because she wanted to bring that to "Pa-ga's house." This is what happens in Daddy's car when we're waiting for him to get our dinner. Ava knows where to put the key in the ignition to start the car. She said "Pa-Ga's house" as if she was driving there herself! We drove up to Lake Oliver to visit my in-laws as soon as Aaron got home from work on Friday night. The drive to Northern Indiana is usually stressful, especially on Friday nights the closer we get towards Ava's bedtime so we were thankful to leave earlier. She rarely sleeps in the car. We have a DVD player and I pack her snacks and toys to play with, but it doesn't always work. 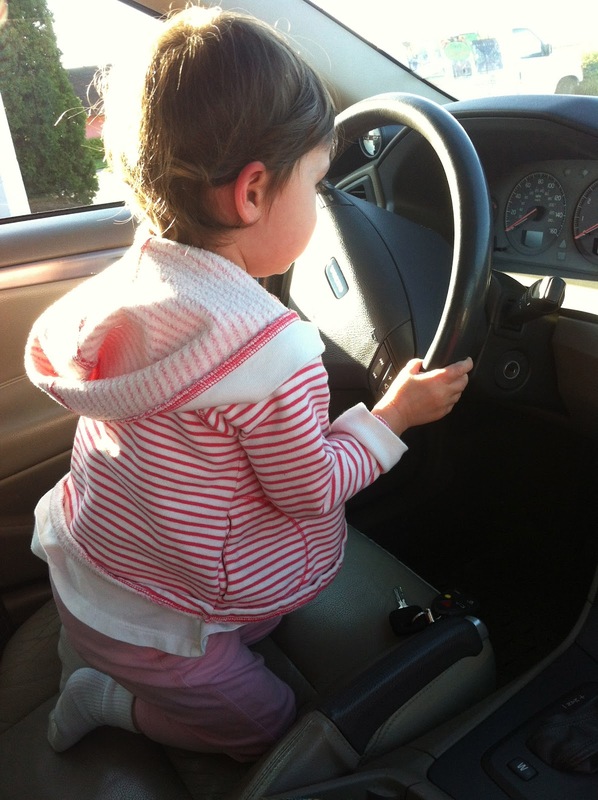 If she sees me or or hears my voice, she can get antsy to get out of her car seat. It's a 2 1/2 drive and sometimes we have to stop so Aaron will get gas and then Ava can nurse. We stopped to grab a quick dinner and gas up. Aaron went inside the restaurant to order our dinner while Ava and I stayed in the car because of course she wanted to nurse! She nursed for a bit then then I sat her in the drivers seat next to me. 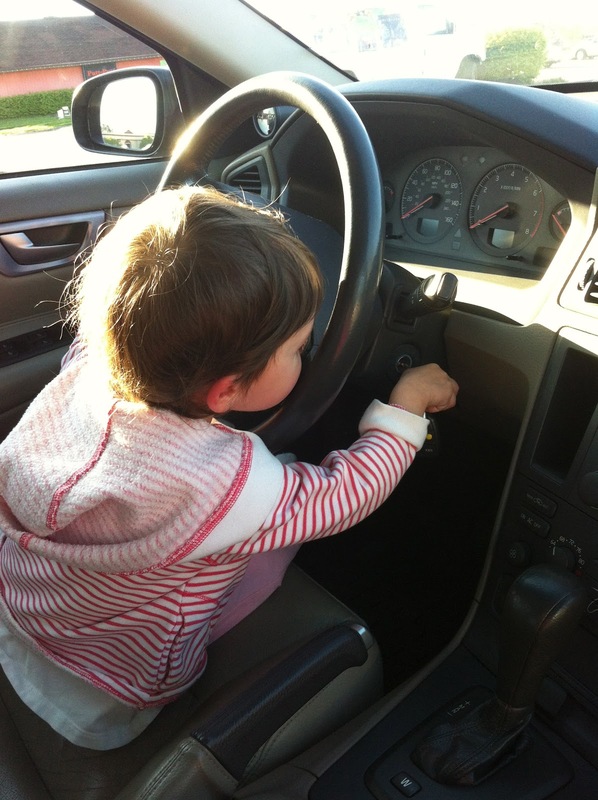 She grabbed the car key and started to put it in the ignition. I watched her closely and was surprised that she knew what to do. When we leave I always start the car with her in my arms and then put her in her car seat. This girl watches everything! Watching a boat go by on the Lake. "Where go?" 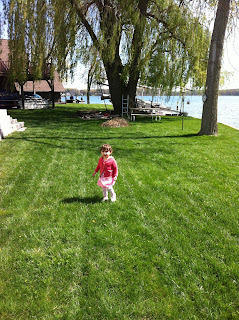 We arrived at the Lake around bedtime, but she was too excited to go to bed. She finally was at Pa-Ga's house! In fact, Ava was so excited to be there that she had trouble falling asleep that night. Saturday morning, we relaxed late into the morning in our PJs. We had breakfast burritos and Aaron got ready to play golf with his best friend, Zac. Ava had so much fun playing with Zac's 4-year old son, Colt! Michele and I ran into town to a Mexican grocery store to pick up my favorite childhood treat, pan dulce (sweet bread). I also found some hibiscus tea. We left Ava with Pa-Ga who walked with her to the channel and she helped him clean the outside of the house. According to Grandpa, Ava asked every couple minutes "Mama home?" He was a good sport! Ava's Easter basket - lavender nail polish, sheep book, stamps, stickers, a toy chick, bunny, Dora Band-Aids, and purple matchbox cars. 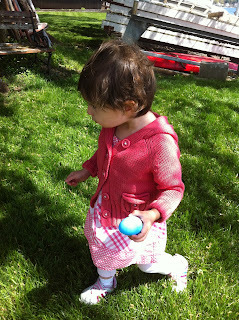 When Daddy got home after golfing, we started the Egg Hunt! Grandpa hid the eggs while Grandma took her on a walk to distract her so she wouldn't see what was happening. It was a bit brisk, but beautiful. As soon as I called them over, Ava spotted her first egg! She opened it and was so excited. 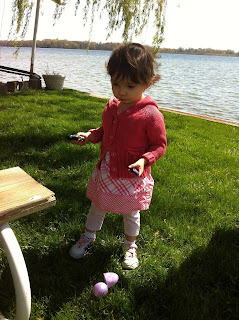 I filled the eggs with her favorite snacks, stickers, a couple matchbox cars because she loves her cousin's so much. She shoved the snacks in her mouth so fast so she could go onto the next egg. She had a blast! 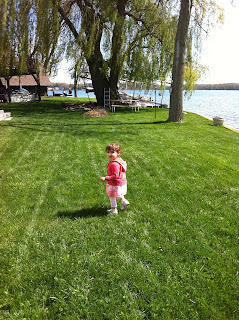 Then Ava got to see her Easter basket. I had so much fun picking it out and she enjoyed it! Great Grandma Berkey and our family friends, Sue and her mom, Grandma Mary Jane, came over for Easter dinner. Great Grandma had an Easter bunny for Ava and some yellow Peeps. 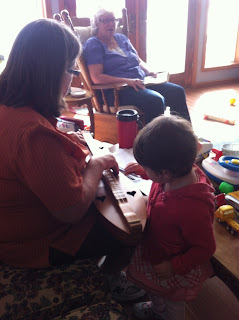 We sat inside and Aaron's mom pulled out her dulcimer. She watched Grandma play it and then grabbed the pick and started playing it! I realized that it was Ava after a few moments. She was great! Ava is really interested in music. We took a pontoon boat ride on the Lake before dinner. It was relaxing! Ava got a little scared when we started to speed up and some water got in front where she was standing so she quickly hopped in my lap. Then she nursed and it was so peaceful that we almost fell asleep. Everyone enjoyed it, including Bena who sat by Grandpa as he drove the boat. Ava didn't sleep much yesterday in the afternoon and she went to bed around 9pm. She was having too much fun playing with Colt who came back over with his parents. We had a lazy morning together at the house while Aaron's parents were at church. I washed Bena because she rolled in deer poop and smelled so foul. Ava watched in amazement as Bena got a shower! We had a quick lunch and then got on the road. When we got home, we relaxed together outside in the yard, enjoying the sunshine. I made a snack to share: celery with peanut butter, raisins, and pretzels made into "butterflies." I planned ahead to use a freezer meal (Chicken Spaghetti, garlic bread, and maple-ginger carrots) so with the extra time, I prepped a split pea soup that I'll make in the slow cooker tomorrow while we're at work. I had a nice late chat with my mother-in-law last night who reminded me that I should live in the moment to enjoy it all! With my crazy schedule, instead of doing something productive I thought I should just relax sometimes and go with the flow. 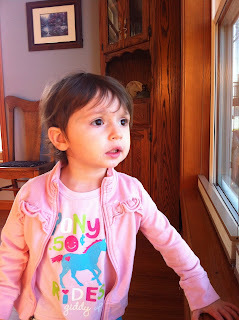 I took her advice this afternoon when I sat outside relaxing with Ava and Aaron instead of doing something else inside. It was awesome! The weekend was so busy and fun, Ava crashed out after her bath quickly to catch up on all her lost sleep. And now it's my turn to head to bed! We had beautiful weather for an Egg Hunt! Excited to look for more eggs. This big egg had 2 matchbox cars. So excited to find the eggs! She literally watched Ma-Ga for a couple minutes, grabbed the pick and started playing. Amazing!